Protein kinases are one of the largest and most influential of gene families: constituting some 2% of the proteome, they regulate almost all biochemical pathways and may phosphorylate up to 30% of the proteome. Bioinformatics and comparative genomics were used to determine the C. elegans kinome and put it in evolutionary and functional context. Kinases are deeply conserved in evolution, and the worm has family homologs for over 80% of the human kinome. 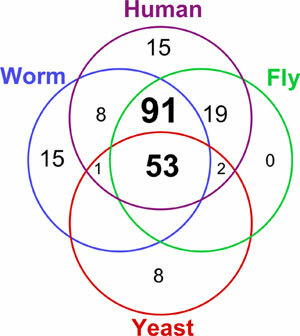 Almost half of the 438 worm kinases are members of worm-specific or worm-expanded families. Such radiations include genes involved in spermatogenesis, chemosensation, Wnt signaling and FGF receptor-like kinases. The C. briggsae kinome is largely similar apart from the expanded classes, showing that such expansions are evolutionarily recent. Copyright: © 2005 Gerard Manning. This is an open-access article distributed under the terms of the Creative Commons Attribution License, which permits unrestricted use, distribution, and reproduction in any medium, provided the original author and source are credited. Protein kinases constitute one of the largest and most important of protein families, accounting for ~2% of genes in a variety of eukaryotic genomes. By phosphorylating substrate proteins, kinases modify the activity, location and affinities of up to 30% of all cellular proteins, and direct most cellular processes, particularly in signal transduction and co-ordination of complex pathways. Many of these pathways are highly conserved, and 53 distinct kinase functions and subfamilies appear to have been conserved between yeasts, nematodes, insects and vertebrates, with a further 91 subfamilies of kinases being seen throughout metazoan genomes. This makes kinase signaling particularly amenable to comparative studies, and kinase activity a particularly good readout of the physiological state of any cell. This chapter will introduce the diversity of kinases in C. elegans, and compare them to those of fungi and other metazoans, as well as to preliminary results from analysis of the C. briggsae kinome. Most protein kinases share a common ePK (eukaryotic protein kinase) catalytic domain, and can be identified by sequence similarity with Blast or profile hidden Markov models (HMMs). The remaining atypical protein kinases (aPK) belong to several families, some of which have structural, but not sequence similarity to ePKs. We used ePK and aPK HMMs, and Blast/psi-Blast with divergent kinase sequences, to identify protein kinase sequences in C. elegans genomic and expressed sequences (Manning et al., 2002; Plowman et al., 1999). We identified 438 protein kinase genes, including 20 atypical kinases, and an additional 25 kinase fragments or pseudogenes. All sequences and supporting data are available at http://kinase.com, and all but 8 sequences are now identical to wormpep (v. 141) sequences. To put worm kinases into an evolutionary and functional context, we compared them with the distant kinomes of human, fly, and yeast. At these distances, 1:1 orthology is rare, so we classified each kinase into a hierarchy of groups, families, and sometimes subfamilies (Manning et al., 2002a; Manning et al., 2002b). The classification is based on sequence similarity within the kinase domain, the presence of additional domains, known biological functions, and conservation across divergent genomes. Across the four kinomes, there are 10 groups, 143 families and 212 subfamilies. The classification of each worm kinase is given in Appendix A. Since kinases perform such a variety of distinct basic cellular functions, it is not surprising to see that 53 subfamilies and functions are present in all four kinomes (Figure 1). A further 91 subfamilies were found in all three metazoan kinomes, including the tyrosine kinase (TK) group and the TKL group, which mediate much of the complexity of intercellular signal transduction. The gain and loss of kinase functions and subfamilies in each evolutionary lineage is also seen. In general, the data support the coelomate clade, where insects are more closely related to vertebrates than to nematodes, rather than the ecdysozoa clade, which groups insects and nematodes together. Figure 1. Distribution of 212 kinase subfamilies throughout four kinomes: the yeast Saccharomyces cerevisiae, the nematode worm Caenorhabditis elegans, the fruit fly Drosophila melanogaster and human. Nematodes share 153 subfamilies with human, providing close homologs for 81% (419/518) of all human kinases. 6 families appear to have been lost from nematodes, based on their presence in fly, human and more basal organisms (Table 1), and several new families have been invented within the coelomate lineage, whose functions predominantly map to immunity/angiogenesis, neurobiology, cell cycle and morphogenesis. There are 13 such human-specific families, and 16 shared between fly and human. Table 1. Kinases lost in worm, or gained in fly or human kinomes. CMGC CDK CDK10 1 1 Cell cycle? Atypical H11 0 1 Apoptosis? Other NKF5 0 2 Testis development? TK Lmr 0 3 Cell growth? On the other hand, the worm shares eight subfamilies with human which are absent from Drosophila (Table 2). These include two receptor tyrosine kinase families, an atypical elongation factor 2 kinase (eEF2K), several members of the CAMK group (MELK, PSK, PIM) and the HH498 subfamily of Mixed Lineage Kinases (MLK). In some but not all cases, the fly genome has related genes that may fulfill a similar function. SGK, eEF2K and HH498 are found in Dictyostelium, and ABC1-C in yeast, reinforcing their secondary loss from insects. The secondary loss of conserved kinases within each lineage highlights how essential functions are dependent on the context of other genes and pathways in the organism. Table 2. Kinase subfamilies shared by worm and human, but not fly. Atypical ABC1 ABC1-C 1 1 Other ABC1 subfamilies may compensate. Atypical MHCK eEF2K 1 1 Eukaryotic elongation factor 2 kinase. CAMK CAMKL MELK 1 1 MELK is an outgroup of MARK, which is present in fly. Splicing function? CAMK PSK 1 2 Human PSKH1 has a Golgi function. CAMK PIM 2 3 Related to PASK, which is present in fly and absent from worm. TKL MLK HH498 1 1 Human form is cardiac-specific, worm is neuronal-restricted. Divergent functions? TK Trk 1 3 Neurotrophin receptor. Fly has closely related Ror and Musk families. TK Met 2 2 Worm has a clear Met homolog and a divergent family member. The C. elegans kinome is also marked by a dramatic expansion of a small number of kinase classes. C. elegans has almost twice as many kinases as Drosophila (438 vs. 241 genes), but virtually all the difference (195 of 197 genes) is accounted for by expansions of a small number of families and of worm-specific families. Fifteen kinase subfamilies are nematode-specific, accounting for almost a quarter of the kinome (105 genes). They include 8 distinct subfamilies within a large expansion of CK1 group kinases, containing 78 kinases, and two FGFR-like receptor tyrosine kinase families. An additional 5 families are in the Other group, and have very little similarity to any non-worm kinases. In general, they are not well characterized. Table 3. Worm-specific and worm-expanded kinase classes. Counts of genes in kinomes. C. briggsae data from unpublished analysis of genome-predicted peptides. These kinases may hold a key to several nematode-specific biological functions. In several cases, the expansions appear recent, as the members are closely related by sequence and chromosomal location, and several appear to have been generated since the C. elegans/C. briggsae split. Many may have reduced or no function: several have lost catalytic or other conserved residues and 20 of the 25 worm kinase pseudogenes are from these families, indicating a high rate of gene turnover. A similar expansion is seen in C. briggsae, and though it appears that this is more modest, some of this may be due to the preliminary nature of the annotation and kinase analysis of this genome. Reproductive functions often drive rapid evolution, and there is some evidence implicating kinase expansions in nematode spermatogeneis. One CK1 gene (spe-6) and one Fer gene (spe-8) function in spermatogenesis, and half or more of these classes are selectively expressed in sperm by microarray analysis (Muhlrad and Ward, 2002; Reinke et al., 2000; P. Muhlrad and S. Ward, pers. commun.). Receptor guanylate cyclases (RGC) have a catalytically inactive kinase domain, and have separately expanded in all three metazoans, but most dramatically in worm (Morton, 2004). Most are uncharacterized, but several are expressed in highly restricted sets of neurons and are implicated in chemosensation, and one (daf-11) is involved in dauer formation (Vowels and Thomas, 1992). The KIN-9 (previously known as kin-6) and KIN-16 families encode receptor tyrosine kinases, whose kinase domains and overall structure most resemble the FGF receptor family. Some of the KIN-16 family have arrays of extracellular immunoglobulin repeats, and some have vestigial extracellular regions (Popovici et al., 1999), while KIN-6 members have diverse novel extracellular regions. KIN-16 includes the old-1 and old-2 genes thought to be involved in age and stress resistance (Rikke et al., 2000). 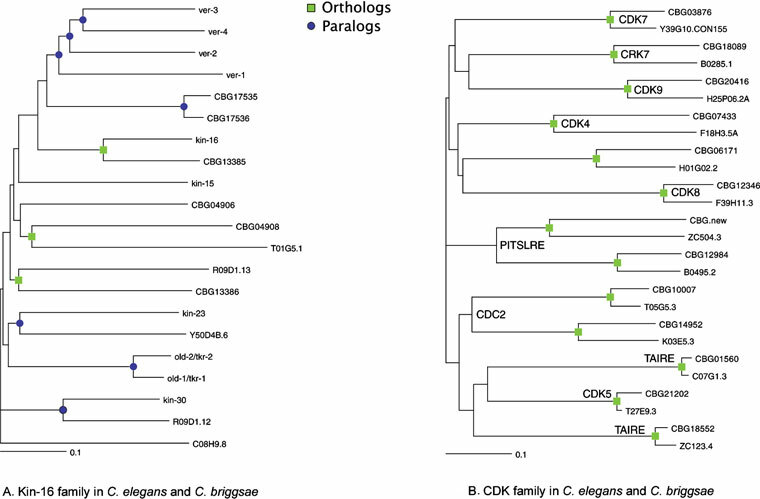 Many of the KIN-16 genes are chromosomally clustered, and are poorly conserved in C. briggsae, indicating a recent origin (Figure 2A). The KIN-9 genes are not clustered and all have briggsae orthologs. Figure 2. Orthology between C. elegans and C. briggsae kinases. Squares indicate likely orthologous pairs of kinases, and circles denote paralogous expansions. C. briggsae sequences are predictions (CBGnnnnn) from the genome project. (A) In the worm-specific KIN-16 family, new genes continue to arise in the elegans and briggsae lineages, as indicated by circles. (B) In the CDK family, all 13 members exist as orthologous pairs and subfamilies (labeled) are also conserved in Drosophila and human. Of the 7 GSK3 members, 6 have clear briggsae homologs, but only one (gsk-3) has been characterized, and it acts in a defined Wnt signaling pathway (Schlesinger et al., 1999). The additional members may act in an expanded Wnt-like pathway, as worms have other duplicated pathway members including three members each of the beta-catenin and dishevelled families. Both CK1 and Fer kinases are implicated in mammalian Wnt signaling, and some of their worm expansions may also function in this pathway. The role of GSK3 in insulin signaling may also correlate with the expansion of insulin genes in nematodes. The expansion of the Jnk stress-response MAPK family is partially paralleled by the expansion of the MAPKK (Ste7) family, which now includes 4 putative Jnk kinases (JNKKs). A preliminary analysis of C. briggsae predicted proteins (release 25; Stein et al., 2003) indicates the presence of 341 kinase genes, using the C. elegans kinome as blast query set. An additional 30 or more kinases or kinase fragments were detected by direct search of the genome, but are still poorly predicted. The majority (320) of C. briggsae kinases appear orthologous to a single C. elegans kinase, by bidirectional blast searches. The main differences between the two kinomes are in the recently-expanded families, where the expansion appears to have continued since the elegans/briggsae split. Of 21 briggsae-unique kinases, 19 are from expanded families, and 98 of 117 elegans-unique kinases are from expanded families. More thorough sequence analysis will likely reveal more briggsae kinases and more ortholog pairs, but this data does strongly support both continued gene birth and death, and sequence diversification, within these expanded families. The difference between conserved and expanded families is shown in Figure 2A of the nematode-specific KIN-16 family, in which few pairs of obvious orthologs are seen between the two species. By contrast, the CDK family has 13 members in both species, all of which pair off in an orthologous fashion (Figure 2B). Phosphatases remove phosphates from kinase substrates, both reversing kinase-based activation, and relieving kinase-mediated repressions. Phosphatases belong to several different families, including a number of distinct phosphatase domains: the PTP (protein tyrosine phosphatase), DSP (dual-specificity phosphatase which dephosphorylates both tyrosine and serine/threonine) and several families of STP, or serine-threonine phosphatases. 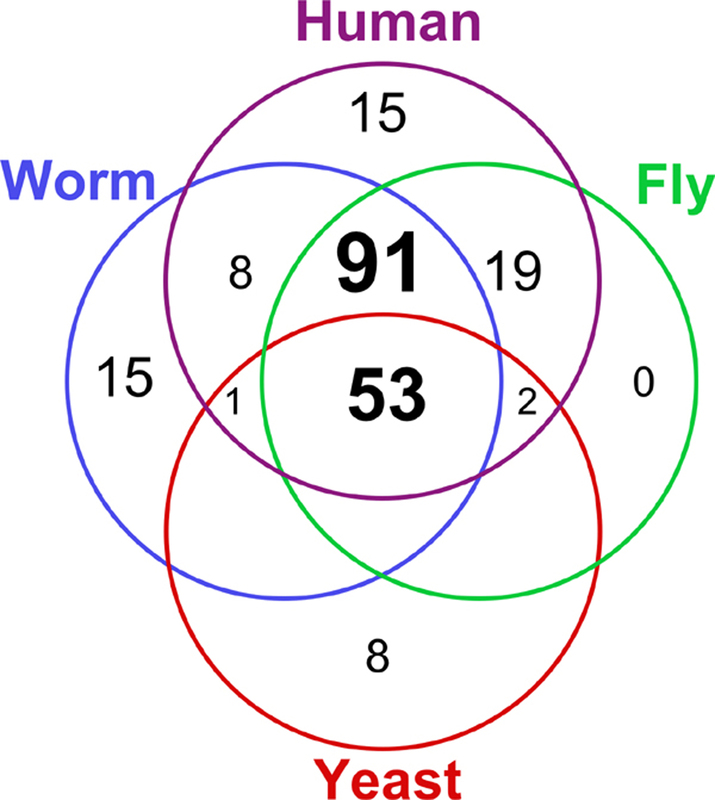 While ‘phosphatome’ analysis lags behind that of the kinomes, an initial survey of C. elegans phosphatases identified 83 PTPs, 26 DSPs and 65 STPs (Plowman et al., 1999). The completion of two nematode genomes and multiple other eukaryotic genomes now opens the door for comparative analysis to identify additional C. elegans phosphatases and to compare their distribution with those of other organisms, and with the expansions of their cognate kinomes. Atypical TAF1 1 All kinomes taf-1 Basal transcription: TFIID associated factor. Other Bud32 1 All kinomes F52C12.2 Essential homolog of yeast Bud32. Other Haspin 13 All kinomes Y18H1A.10, K08B4.5, C50H2.7, T05E8.2, ZK177.2, H12I13.1, Y48B6A.10, C01H6.9, F22H10.5, C04G2.10, Y40A1A.1, Y73B6A.1, aSWK457 Nuclear kinase; meiosis? TK-RTK DDR 2 All metazoans F11D5.3, C25F6.4 Discoidin domain receptor. *Edited by Iva Greenwald. Last revised December 10, 2005. Published December 13, 2005. This chapter should be cited as: Manning, G. Genomic overview of Protein Kinases (December 13, 2005), WormBook, ed. The C. elegans Research Community, WormBook, doi/10.1895/wormbook.1.60.1, http://www.wormbook.org.